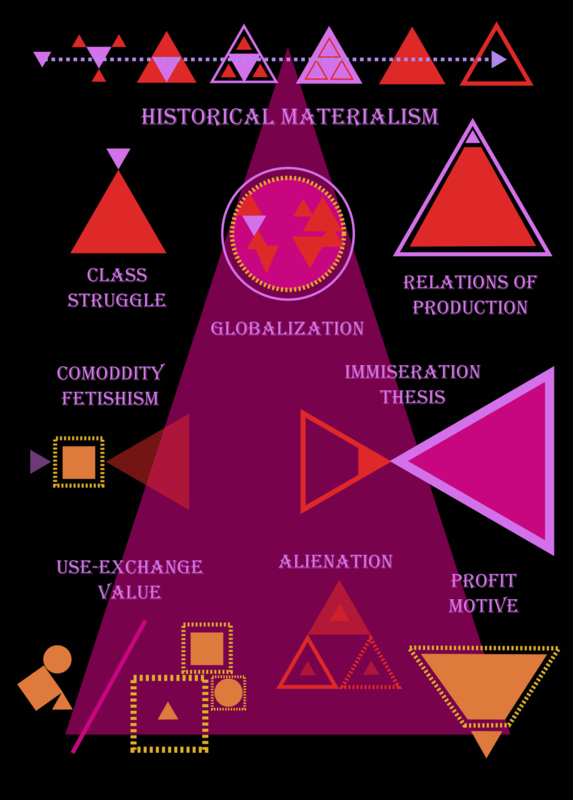 Marxism provides a description of history as a dialectic between class relations in terms of modes of production. Following Hegel, Marx inverts the primacy of ideas into the primacy of material conditions necessary for survival; such conditions are summarized by relations of productions where members of a society must engage in social relationships as a means towards life. While Hegel’s lord-bondsman is a dialectic of reaching self-consciousness (freedom of will), Marx’s aristocrat-slave, lord-serf, and capitalist-proletariat are dialectics of reaching economic equality (freedom of realization or means of production). Throughout history, the antagonisms between the prevailing class (those who control the means of production) and the under class (those who do not) have created conflicts that have resulted in the overthrowing of the former by the latter and the synthesis of a new class (class struggle). For example, small tribal societies originally held property in the commons but would eventually acquire slaves to work the lands after the agricultural revolution. Tribes banded together and formed villages that grew into cities where the ruling families became Aristocrats. The growing expanse of territory had to be cultivated by an ever-increasing slave population that exceeded their replenishment; this phase culminated in the fall of the Roman empire which grew too large to be maintained (Barbarians completed the revolution with the sacking of Rome). From the remains emerged local lords who owned land that were occupied by serfs (once freeman); serfs subsist off the land but were required to give a fraction of their produce back to the lord as well as to work on the lord’s other properties. Over time (and land shortage), the freemen were able to urbanize and create a middle-class that became independently wealthy from trade/commerce; this marked the end of feudalism and gave rise to the capitalist class who could hire freemen on a wage to do work. In capitalism, the means of productions (e.g. machinery, material, land) are privately owned by the capitalists who employ workers to labor and produce commodities; workers relinquish their ownership of their product (labor) and given a wage (money). To maximize profit, the capitalist seeks to minimize the wage given the worker (enough that the worker can subsist on as to continue working the next day) and the reap the surplus of labor (anything produced beyond the fixed costs) to be sold on the market. Such relations between capitalist-worker and capitalist-capitalist are obscured by the perceived value of objects on the market which are mistaken for their intrinsic value (commodity fetishism); a laptop has a price tag but it hides the cost of production and those engaged in its transactions. The economic consequence is the appearance of an autonomous market that ascribes prices (and thus labor value) to commodities that are independent of the consumers (use-value).The far-reaching consequences are the pursuit of new markets in different territories (globalization), the development of new technologies (subjugation of creativity) to more efficiently extract resources (enframing/challenge nature to produce something for standing reserve, Heidegger later) and replace labor, and the alienation between workers. The social alienation through labor is manifested in several forms. The first form occurs between workers and the products which he/she have no control over the prices of; workers are given little input as to the design of their products (inventions are patented) and receive little or no share of the profits. Second, Workers through the divisioning of their labor (sake of efficiency), are given repetitive/assembly line tasks that alienates him the total product; this differs from craftsman and serfs from the middle-ages and the Renaissance who produced their products from start to finish. Third in the psychological dimension, the worker loses his ability to objectify his will/intentions; his will is subordinated to the external demands of others for stretches of time. Last, the final form of alienation occurs between workers who are reduced to relations of competition for higher wages; the unemployed for example can threaten to take your jobs at a lower wage. While alienation is a socially damaging effect of capitalism, Marx stressed that it is the economic contradictions within the capitalist’s mode of production that would be responsible for the next revolution. His immiseration thesis theorized that the worker’s economic impoverishment would deteriorate through the capitalist’s exploitation and greater accumulation of capital (inequality). The thesis is debatable as capitalism, through reforms (government minimum wage, unions) and its drive for new technologies have improved the standard of living (creation of the middle class that benefits the most) for workers; conversely, the average wage has hardly changed in the last forty years. Regardless, such a revolution proscribes to wrest and redistribute private ownership of the means of production back to the workers (socialism) which progresses towards a stateless society without economic classes (communism). Many authors have expounded on the many contradictions inherent to capitalism in more recent times (I recommend David Harvey) and so I’ll leave this discussion for a later time and conclude this blog entry.